Purpose: Use this document as a reference for copying a requisition in ctcLink. 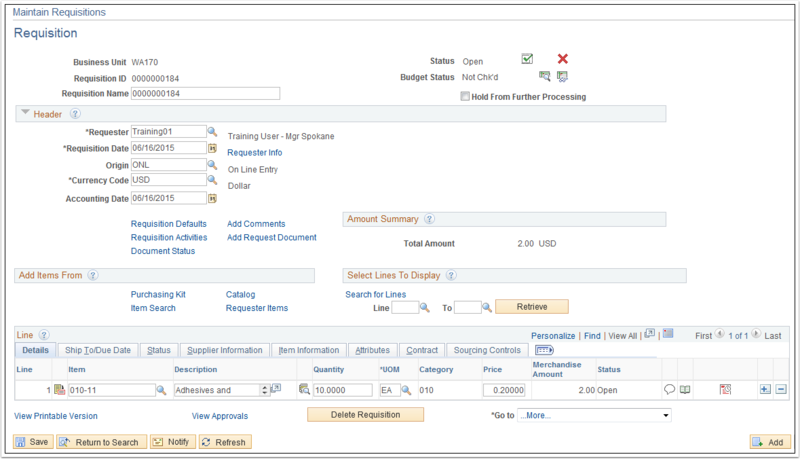 One of the easiest ways to create a new purchasing requisition in ctcLink is to copy an existing one. You can select an existing requisition to copy regardless of its status. 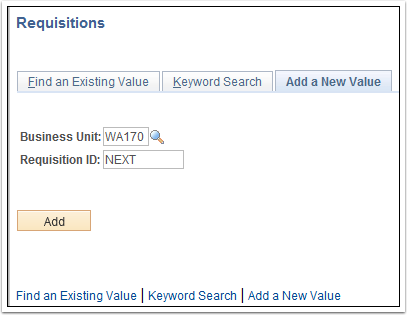 Use the Add a New Value tab on the Requisitions page to add a new value. If it didn’t populate, enter or select the appropriate business unit in the Business Unit field. 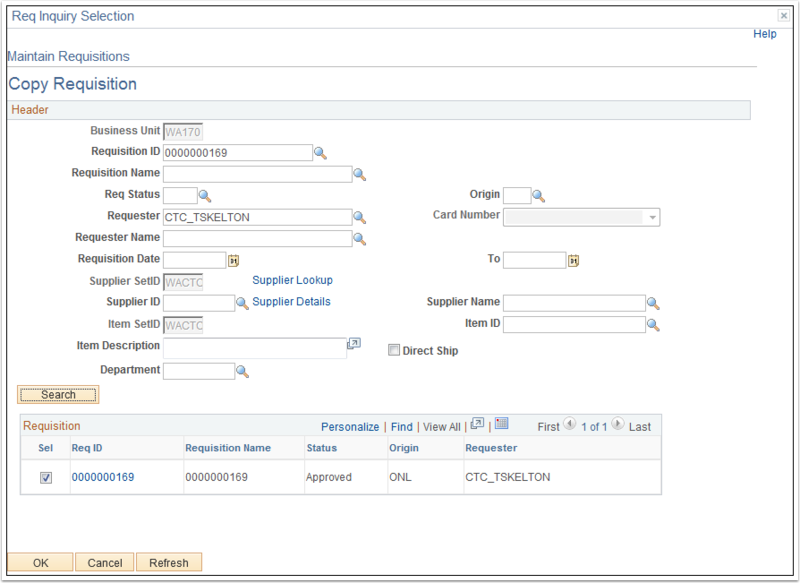 Leave the default value of NEXT in the Requisition ID field. 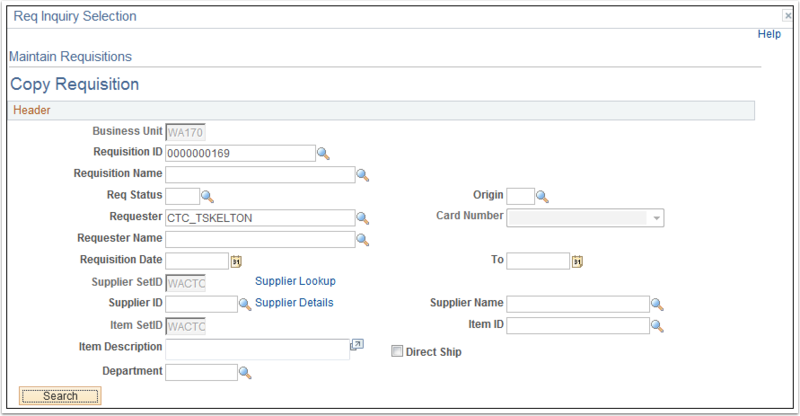 Enter or select the Requisition number in the Requisition ID field. Note: If an entry is made in this field, proceed to click the Search button and make your selection. Enter or select a status in the Req Status field. To display only those requisitions you created enter or select your name in the Requester Name or Requester field. 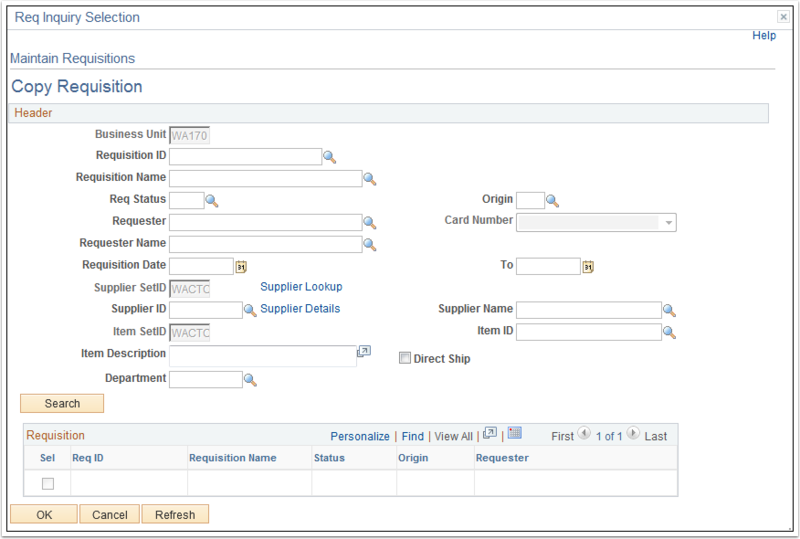 To display only those requisitions for a specific supplier, enter or select the supplier in the Supplier ID or Supplier Name field. Enter or select the appropriate department in the Department field. Once satisfied with the search criteria, click the Search button. The matching requisitions will show below. Select a requisition to copy and click OK. Note: If you want to preview a requisition before copying it you can click the hyperlinked Requisition ID. The requisition lines from the copy source are copied into your new requisition. The header information of your requisition is unaffected. Review the requisition line(s) carefully. If you copy a requisition line that has a value for Due Date (for example), it might be several years old. The line might have now-inappropriate comments. It is your responsibility to ensure the validity of the data. 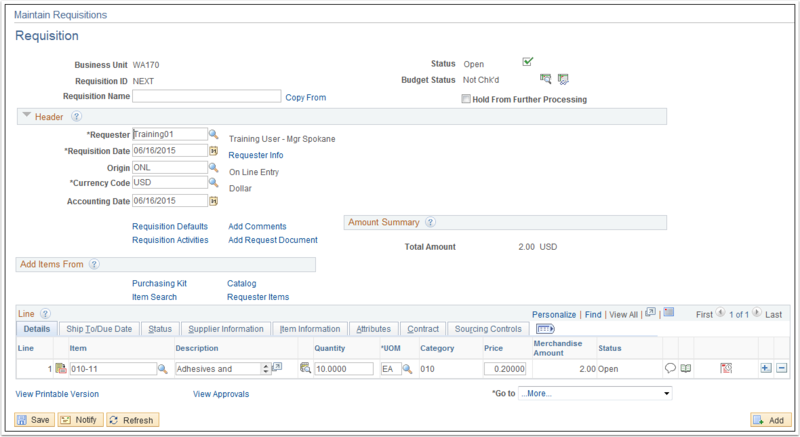 Add additional lines or remove lines as needed using the Add multiple new rows [ + ] and Delete rows [ - ]buttons at the end of each requisition line. When finished updating the new requisition, click the Save button. Note that your requisition has been assigned a unique Requisition ID that can be used to identify it. When you are satisfied with the requisition, submit it for approval by clicking the Submit for Approval icon.